GAINESVILLE, Fla. — After grabbing an early lead and fending off threats late in the game, the South Carolina Gamecocks beat Florida 4-2 Friday to even their baseball series at one game apiece. 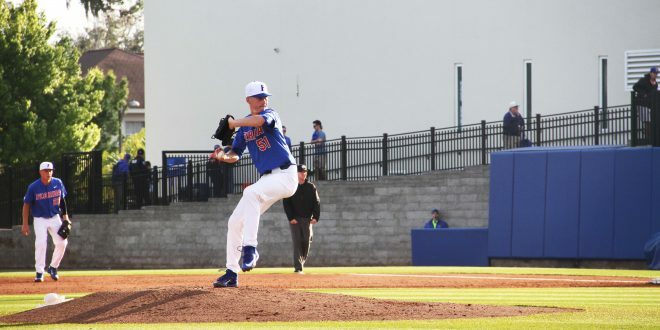 Florida started Brady Singer on the mound and the usually reliable righty was not at his best in this one. In fact, Carolina jumped out to a first inning 2-0 lead on a long home run by first baseman Carlos Cortes over the right field wall. 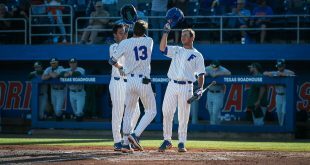 It was the first home run Singer has given up in his Gator career, a span of 108.1 innings. Singer said he didn’t realize he let go of such a long streak and that the pitch just missed its spot. Brady Singer gives up his first home run in his #Gators career. JJ Schwarz recorded the first Gator hit of the night in the second frame and Christian Hicks followed up with a single to put runners on the corners. Freshman Keenan Bell fought his way through a full count before sending a hard hit grounder to left field to score Schwarz from third. The Gamecocks escaped further damage with a 6-4-3 double play to end the second with a 2-1 lead. Both Singer and Gamecock starter Wil Crowe kept offenses to a minimum even though they both had to work early. Neither team recorded a hit in the third, fourth or fifth inning. The Gamecocks extended their lead in the sixth. Chris Cullen led off with a single through the left side and Jonah Bride moved him into scoring position with a sacrifice bunt. Then an RBI double by Jacob Olson plated Cullen. The line drive was just inside the third base line and made it’s way to the corner of the left wall to give the Gamecocks a 3-1 lead. It was the first time Singer allowed more than two earned runs in a start this season. Gator head coach Kevin O’Sullivan said although he may not have pitched as effectively as he normally does he still gave the team a chance to win. Singer was relieved by lefty Nick Horvath who was brought in to get a left handed hitter out, which he did. Florida then went to senior Frank Rubio on the mound. 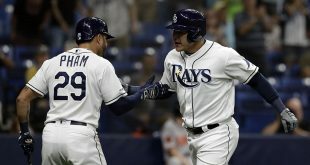 Rubio, the expected closer going into the season, had struggled in his role to seal the deal and reduce damage throughout the beginning of the year. In his 12 game appearances he recorded a 4.15 ERA. O’Sullivan said the coaching staff was confident Rubio just needed a good outing to shake it off. He did just that on Tuesday against the University of North Florida. He earned the win with a career-long outing of four scoreless innings including three strikeouts and just two hits allowed. Rubio got a ground out to get out of the inning and leave two South Carolina runners on base. He gave up two hits in the seventh, putting runners on first and third and the Gamecocks would eventually score a run on an RBI ground ball to make it 4-1. Trailing by three runs it looked like the Gators might be able to get something going in the bottom of the seventh after Nelson Maldonado led off with a single but Schwarz grounded into a double play and Hicks struck out swinging. Freshman Kirby McMullen was brought in for Rubio on the mound and he worked a scoreless eighth inning. O’Sullivan was pleased with how the young guys performed but was frustrated with some of the positions the team put themselves in on defense. In the eighth, Bell led off with a single up the middle, which prompted the Gamecocks to go to their bullpen. Tyler Johnson entered for starter Wil Crowe who pitched well to get the win for South Carolina. But Johnson ran into trouble. Mark Kolozsvary doubled and Deacon Liput walked to load the bases. 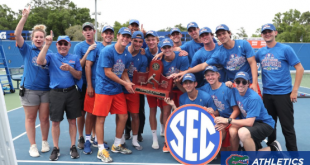 But, as has happened many times this season, the Gators could not capitalize. Dalton Guthrie popped up to short, Austin Langworthy struck out and Ryan Larson hit a ball very hard to left center field that the wind held up and it was caught to end the inning. Freshman Tyler Dyson worked a scoreless ninth on the mound for Florida and again the Gators tried to rally in the bottom half of the inning. Maldonado got the inning started, drawing a walk. Schwarz singled off of the pitcher, Johnson, to put runners on the corners. With Hicks at the plate, a balk was called that brought in Maldonado and the Gators looked like they might execute the comeback win. But Johnson settled down, retiring Hicks on a pop up and then shut down the next two Gator hitters to close out the game. O’Sullivan reflected on some of those missed opportunities late in the game and how a different approach at the plate could have resulted in a different outcome. The two teams are both 9-8 in the SEC and will decide the winner of the series noon Saturday. The series finale will air live on ESPN2.